The Piaggio is an Italian designed and built 6 seater, small commuter airliner developed from an earlier amphibian design, and first flown in November 1957. Hence the high wings and engines to keep them up and away from water spray. Various models were built of different capacities, with later models using more powerful turbo-prop power plants. The aircraft had excellent short take off ability and was used extensively in New Guinea for its good short field landing and take-off ability. Affectionately called the Pig by pilots. Our aircraft (c/n 365) was built in late 1959 and first registered in Britain in 1960. 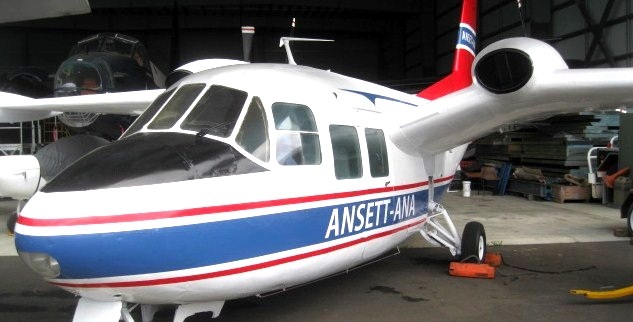 She was imported to Australia in 1967 and was, amongst others, variously owned by Macrobertson Miller Airlines, Ansett Transport Industries, and Tasman Airlines of Australia. She was declared un-airworthy and retired in 2002 and moved to HARS in 2008. She stands as a special exhibit at the Eastern end of Illawarra Regional Airport.